Does your business lack vision and focus? Is your brand reputation creating obstacles? Could you increase profits by charging a price-premium? Find the answers in a brand workshop. It’s a time-efficient and cost-effective method to drive business growth. Below are just two typical challenges a brand workshop can solve. Your business got off to a flying start with enthusiasm and ideas. Over time the dreaded ‘mid-life doldrums’ has set in. Ideas have stagnated, and now people seem to turn up just to do a job, take a salary and leave. The business has lost momentum and lacks the focus to take it to the next level. Focus: Successful businesses revolve around a big idea that unites customers and employees behind a purpose. Over time this can be lost or watered down. A brand workshop will refocus your big idea, so everyone knows what you stand for. Direction: A directionless business is a lost business that wastes valuable resources. A brand workshop brings together your key stakeholders to redefine the long-term goals of the business. The output is a vision that helps build your roadmap to growth. Productivity: Working for a lacklustre business is demotivating. Modern employees need more than functional reasons to go to work, they need to contribute to an organisation that’s going places. A brand workshop revitalises the heart of the business and re-energises workforces around a shared vision. It helps you attract high-quality talent and keeps everybody motivated across your business. The market is overcrowded with ‘me-too’ businesses and you’re struggling to stand out from the competition. A common tactic is to discount prices or offer more choice, whilst some try to outspend the competition to gain visibility. These are short-term tactics that are doomed to fail. Positioning: Smart businesses should out-manoeuvre the competition instead of out-spending it. A brand workshop helps you find your strategic white-space so your brand can breathe and flourish. Whilst your competitors fight amongst themselves and waste resources to be heard, you are recognised as the expert in your field. Messaging: Well-articulated messages help your audience understand why they should engage with you. In a world of time-poor people and overwhelming choice, you only have a moment to capture their attention. A brand workshop will help you to define your audience better. You can then deliver messages that pinpoint their needs more efficiently and build a competitive edge for your business. Naming: An unforgettable brand name is a critical element in your business strategy and sets you apart from your competitors. If you’re launching new products, services or extending into new markets, a brand workshop will guide you through the considerations of naming and find a unique name that stands out. 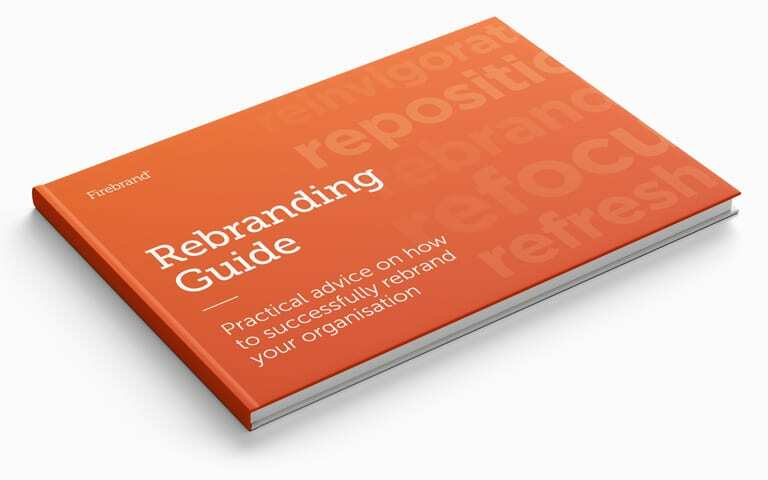 A practical guide to successfully rebranding your organisation. Get our latest brand insights delivered straight to your inbox. We help solve real business problems and deliver greater commercial success for our clients.